Wash towels less often. Towels don't need to be washed as often as clothing. We literally just use them to dry off after a shower, they really don't get dirty! If you're washing towels after every use or two, simplify your routine by stretching the amount of time between laundry day for towels. Find the simplest laundry system for you. This just takes practice so there's not a one size fits all approach that I can recommend. I just recommend taking this month to figure out what works for you by trying a few different options. Some people with larger families prefer to throw a load in every single morning, in order to stay on top of things. Others will assign a day to a family member, to assist in putting clothes away - you already know everything in the wash on that particular day belongs to your daughter and therefore can go straight to her room without having to be sorted. For me, I got my clothes down to one load a week, which I do on Thursday nights (Fridays are casual at my office so it just makes sense to me for some reason to clean everything Thursday so the work clothes are done and I also have casual weekend clothes.) I do sheets and towels as needed on Sundays. That means the rest of the days are open for John to wash his fire gear and other work clothes whenever he needs to, since that schedule changes every week. Wash on cold. Here's the truth: I never separate my clothes unless I acquire an item that's very red/pink or very dark, and then I wash it with like colors on the first wash. Other than that, everything goes in together, no matter the color. I simply was everything on cold. Cold water gets clothes clean, dissolves detergent, doesn't shrink clothes, doesn't fade colors, helps colors not to bleed, and uses less electricity. The only time I'd want to use hot water is for sanitizing purposes, but since I'm not washing cloth diapers, I'm just fine with sending everything through on cold and never sorting clothes. Have enough socks and underwear for at least a week, or your typical wash cycle if longer. I limit washing my clothes to once a week, in one load of laundry. I just don't have that many clothes, so it works. But what I highly recommend when it comes to keeping things simple is to make sure you have at least enough socks and underwear (for everyone in your family) to last at least one week without having to do laundry, or more if your wash cycle is longer. But I don't recommend much more than a week, otherwise you start having too many clothes. The thing you're trying to avoid here is the panic 'I have no clean underwear' mid-week load of laundry, which is just stressful. And also wasteful. Never leave a room empty handed. If you're getting up and leaving a room, never leave it empty handed. This is the easiest way to keep a house organized without you having to constantly devote time to cleaning. Did you get a cup of tea while you sat in the living room to read or watch TV? When you get up to go to the bathroom or go to bed, take that cup with you. Just showered? Take the dirty clothes with you out of the bathroom. Keep this in mind every time you leave a room - what can you take with you that doesn't belong there? Soon it'll become second nature and you won't have to make 10 trips to clean up your main living spaces. Store things based on ease to put away. If you want something, you're going to get it out. It doesn't matter how long it takes to find or how many things you have to move out of the way to get to it, you're going to get it. The same cannot be said for putting things away. Perfect organization systems be damned - if it's too hard to put the shoes away in the closet, they won't make it there. Put a mat by the front door where the shoes end up anyway and call it a day. It might not make sense to a professional organizer, but your storage only needs to make sense to you. You will only put things away if you make it very, very easy on yourself to do so. No complicated color-coded systems, no boxes with tricky lids or things stacked on top of each other. Simplify. 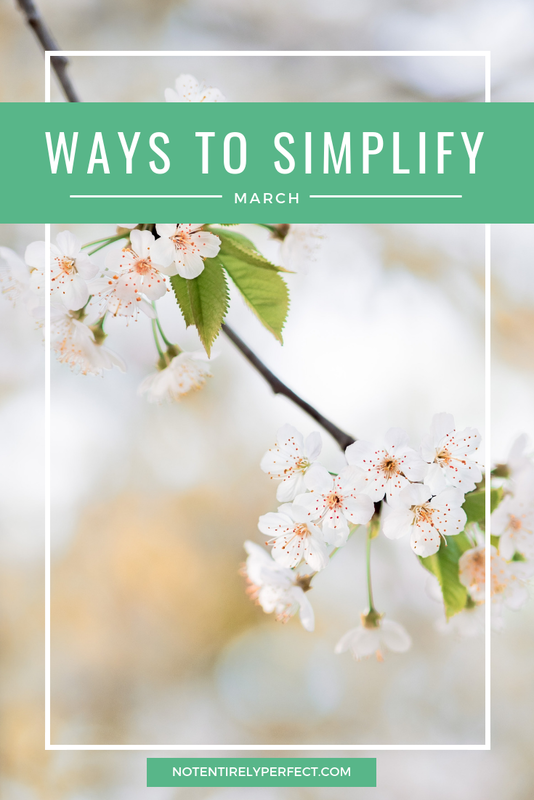 How will you simplify this month?